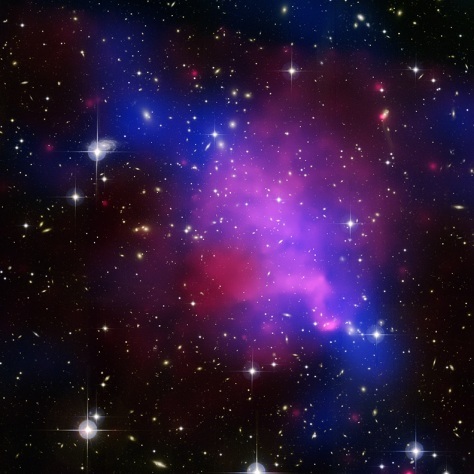 This multiwavelength image of Abell 520 shows the aftermath of a collision of galaxy clusters. In this image, the hot gas as detected by Chandra is colored red. Optical data from the Canada-France-Hawaii and Subaru telescopes shows the starlight from the individual galaxies (yellow and orange). The location of most of the dark matter in the cluster (blue) was also found using these telescopes. Scientists say the concentration of dark matter does not line up with the concentration of normal matter — which is puzzling.